Divers who planned to euthanise the animal the following morning found it already dead, along with a fifth banjo that had been knifed in the head. Ms Bowman had previously reported seeing 18 dead, discarded rays on a single dive at the same pier, including a less commonly seen eagle ray. AJ Morton of mobile scuba school Dive2U photographed a mutilated fiddler ray on 12 May: “Another Banjo…this time at Frankston Pier. Had its mouth ripped open and left for dead for the sake of a $2 hook. Wasn’t even at least put out if its misery. Just a blatant disregard for the welfare of the animal.” Scuba Instructor Jacqui Younger photographed a banjo that had met a similar fate at Portsea Pier the following day. While the injuries inflicted upon these rays are particularly brutal, Melbourne-based Project Banjo are collating a growing body of evidence that such attacks against rays in Port Phillip Bay are not isolated events. Testimonials and photographic evidence supplied by the ray advocacy group are evidence that rays have been slaughtered as unwanted catch regularly for many years across the piers of Port Phillip Bay and Westernport, including but not limited to popular fishing and diving spots Portsea, Blairgowrie, Rye, Frankston and Flinders. Diver Zain Fimmel attests to having euthanised countless rays left for dead across many years of diving. In additional to scuba divers, snorkelers and free divers who are appalled by the frequent mistreatment of rays throughout the bay, many within the recreational fishing community of Port Phillip Bay are also voicing their concerns and are supportive of the proposed bans. While the rays are considered a non-target species by most anglers, when ‘kept’, the smaller animals are very occasionally taken for food and possibly for use as bait for crab pots. Fishing forums reveal that the large smooth rays are often taken for shark bait, and it is widely held that ray wings are often shaped into circular discs and sold as ‘sea scallops’ in some restaurants. This commercial activity would not be permitted against the recent ban of commercial fishing in Port Phillip Bay, which currently restricts the recreational capture of rays to a bag limit of five rays of any species per person per day. The Australian Federal Minister for Agriculture Jaala Pulford stated in her reply to Project Banjo, ‘I share your concerns about the need for fishers to respect and treat fish humanely.’ Representatives of Project Banjo have met with Fisheries Victoria Executive Director Travis Dowling who reports directly to the Minister, Director of Education and Enforcement Ian Parks and Fisheries Victoria Director of Policy and Licensing Dallas D’Silva to discuss ways in which the socially unacceptable treatment of both wanted and unwanted rays can be addressed. The regulatory body has acknowledged the need for signage to be displayed at the fishing end of piers in response to clear community concern, and for further measures to be developed involving processes of community consultation. Discussion between the stakeholders has taken place around broader community awareness, educational initiatives, monitoring efforts, issuing of fines for offenders and potential regulatory reforms. 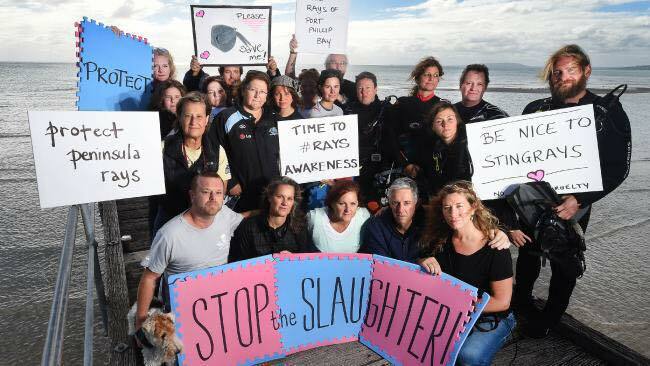 Sadly, the mistreatment of rays is much broader than the situation being spotlighted in Port Phillip Bay. Individuals and lobby groups across Australia such as ‘Supporting Sharks and Rays in SA’ are collating growing bodies of evidence of long-term abuses against rays and campaigning for regulatory responses. It is hoped that the current progress being made towards collaborative solutions in Victoria can be leveraged towards greater protections for these significant marine animals across the country. Friends, we’ve all been seeing these travesties for far too long without taking action. We are now determined to see a win-win outcome for all stakeholders – for locals, visitors, tourists, fishers, divers and the rays themselves. Port Phillip Bay is a gorgeous place and the rays are a huge part of what makes the bay so special. No-one is willing to sit back and just watch more of them being senselessly mutilated and slaughtered. It’s time to ‘rays awareness’ that these animals have so much more value alive than dead. There’s nothing more amazing than seeing a huge smooth ray or a gorgeous banjo gliding beneath the piers or in the shallows, and nothing more tragic than seeing them chopped up and discarded like garbage. Port Phillip Bay should be recognised as a beautiful ‘Bay of Rays’ that needs to be celebrated and protected. If you’ve read this article this far, chances are you care enough to help make a difference on this issue? Please sign and share the PETITION and speak out proactively against this wanton inhumanity. There is so much wrong with this world, but if every person begins to speak and be proactive on the basis of their convictions, we just might start moving in some better directions towards better outcomes. Will you please help to give these voiceless victims a voice and dare to make a difference? Every voice counts. I encourage everyone who follows this blog to consider how you might be able to stand up to make a difference on this issue or another issue that is close to your heart and conscience. This entry was posted in Blog, Photos, Videos and tagged animal, animal welfare, animals, Australia, banjo, banjo sharks, Blairgowrie, conservation, cruelty, Dallas D'Silva, david attenborough, David Kramer, fisheries, fisheries victoria, fishing, flinders, frankston, Greg Hunt, Jaala Pulford, jacques cousteau, jean-michel cousteau, justice, Melbourne, Mission Blue, ocean, ocean conservation, Paul Woresteling, pink tank scuba, Port Phillip Bay, portsea, pt hirschfield, rays, rays awareness, recreational fishing, responsible fishing, Rex Hunt, RSPCA, Rye, Rye Pier, scuba, scuba diving, Sharks, stingray, stingrays, sylvia earle, Talking Fishing, tourism, tourism australia, Travis Dowling. Bookmark the permalink. So very sad. All the best in your endeavours to see some significant changes to the current outdated laws. Thank you so much Marion – even seeing better enforcement of current regulations will provide an excellent start. I donât understand why they are doing this? If they arenât taking them to eat, why hurt them at all? Am I missing something? This is shattering. My most memorable snorkle ever involved slowly picking up and placing a Fiddler Ray(Banjo shark) on my belly only to find it not only stayed but gently snuggled into me. I just love these and the Port Jackson’s especially …they are both so docile and beautiful. We should demand they become protected as they are defenseless to the ignorant fishers and other reckless ugly individuals that harm them…it makes me so sad and angry at the same time. Let’s make this happen people.. Thank you so much for your support of this campaign Olympia. This makes me so sad… I didn’t realise it was this bad :-(. It really is the last thing you want to see when you go for a dive.